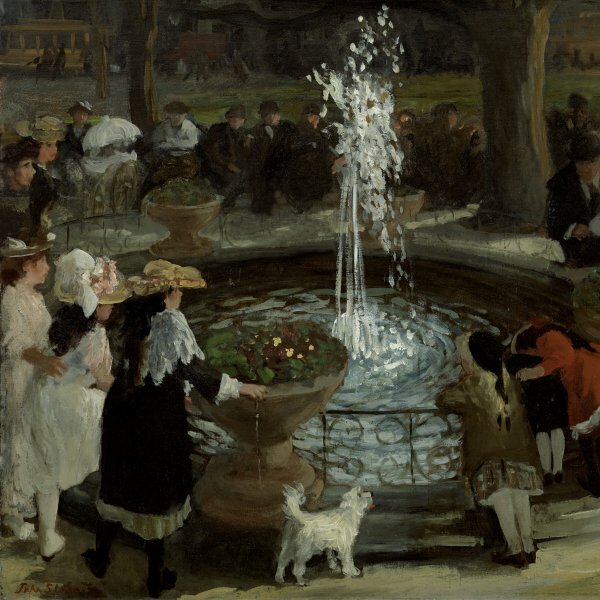 Like John Sloan, George Bellows trained as an artist in New York under the supervision of the realist painter Robert Henri and was also involved with the group of The Eight. Although Bellows, a very talented painter, was not turned down by the spring exhibition of the National Academy of Design in 1907 and never officially belonged to The Eight, he nonetheless took part in some of the group’s shows, as he shared their dislike of academic rigidity and superficiality and embraced similar highly realistic social themes. Bellows developed an interest in portraiture in his final years. 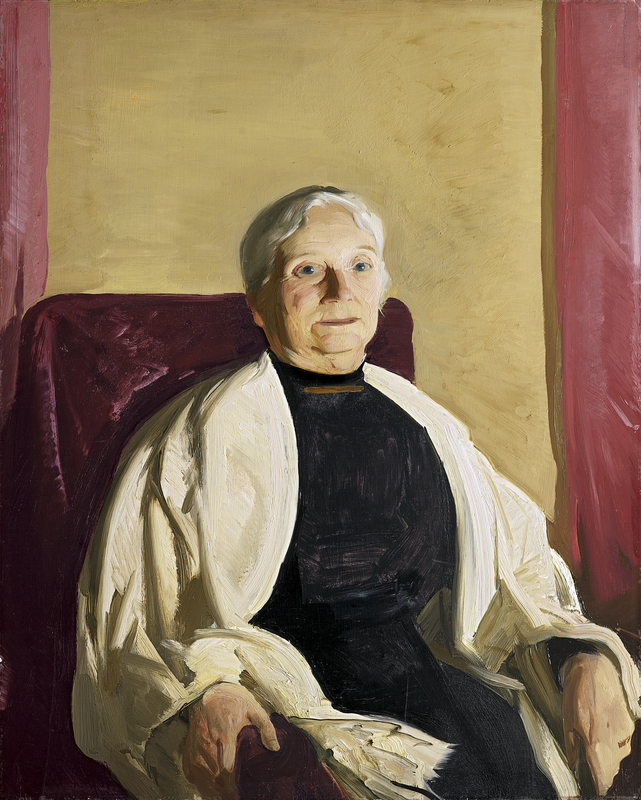 This panel painting, entitled A Grandmother, was executed during summer 1914 on Monhegan, a small island off the coast of Maine, where the artist painted portraits of several locals. By choosing not to identify the sitter, Bellows presents us with an archetype. A women of mature years with great dignity and inner strength poses stiffly, gazing straight at the viewer. Bellows was always interested in the expressive potential of elderly people and, as in similar paintings, focuses his attention on the face and hands of the figure. The sobriety of form and colour — typical of this period — may be due to the impact of the radical modernism of the works exhibited at the Armory Show in 1913. The palette, restricted to the red of the vertical bands of the curtains that frame the figure, the ochres of the flat background, the dark tones of the armchair and dress, and the light, glowing colours of the shawl and face, contrasts with the powerful illumination.